Click here for a sample of Unlocking The Bible. Taking an overview of the unique story of God’s relationship with his people, Unlocking the Bible gives a real sense of the sweep of biblical history and its implications for our lives. 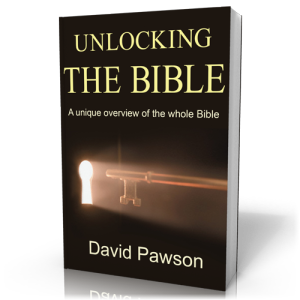 Unlocking the Bible brings together a lifetime’s worth of insights from David Pawson, widely respected as an international writer and speaker, into the meaning of Bible events and teaching. The culture, historical background and spiritual significance of all the important events are explained, with careful examination of their wider impact, right up to the present day. This is a fantastic opportunity to get to grips with the Bible as a whole. David Pawson writes in the foreword: “I suppose I am what the French bluntly call a ‘vulgarizer’. That is someone who takes what the academics teach and make it simple enough for the ‘common’ people to understand. I am content with that. As one old lady said to me, after I had expounded a quite profound passage of Scripture, ‘You broke it up small enough for us to take it in.’ I have, in fact, always aimed to so teach that a 12-year-old boy could understand and remember my message.”? “I cannot think of a better book for new believers to read than this. Motivation to make Bible study more than a just a discipline – a fun hobby.”? “This is the only book I’ve read so far that gives me a desire to study Leviticus, Numbers, Deuteronomy, Jeremiah, Lamentations, etc.”? “Unlocking the Bible”? is exactly what this book does. It’s not theologically heavy, and you’ll find yourself intrigued and desiring more and more of the Bible when you read it!”? “Love, love, love this book. I love David Pawson’s style of teaching. Very understandable and simple. This is a great companion to studying the Word.”?